For every movie-worthy startup success story (think Facebook), there are plenty more stories of unachieved dreams that we will never get to hear about. And that shouldn’t be surprising at all. Not when statistics show that about 50 percent of new businesses fail within the first five years. Sometimes, those numbers can be much higher too. Startups have been known to have a failure rate of up to 90 percent! If there is anyone who understands the kind of hard work it takes to make a startup work, it’s Jessica Mah. She’s the founder and CEO of inDinero, a company that provides a wide variety of tax, accounting, and bookkeeping services for business owners. Started in 2010, inDinero has experienced its fair share of failure and has emerged victorious. 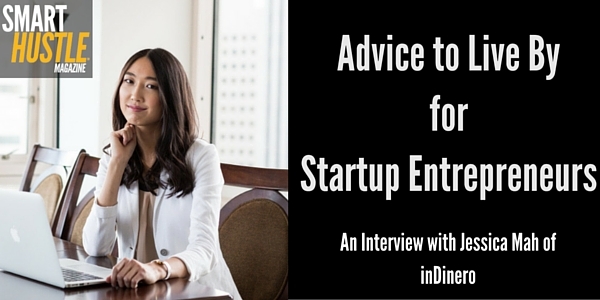 In this interview, Jessica Mah talks about her journey to success and provides advice that many entrepreneurs will find useful. Click play below to listen to our full interview, but here are a few pieces of advice to get you started. It is a bad idea for you to leave your full-time job without a plan, in order to concentrate on your entrepreneurship venture full time. Her advice to entrepreneurs just starting out and looking to quit their day jobs is very solid: Leaving your stable job without doing your market research is a big no-no. You should never do it. Lining up prospective customers is a good idea. It enables you to learn what exactly it is that people want and are willing to pay for. You can then determine whether your product is worth selling as it is or if it needs more fine tuning. If you can collect a list of people willing to pay money for what you have to offer, then you reduce the risk and stress associated with starting a new business from scratch. This is something that worked well for Jessica and can work for you too. Jessica started her business when she was fresh out of college. She had big dreams and launched her business with a bang. What she didn’t have, however, was the experience required to run a business or any idea of what her target customers really wanted. In the beginning, inDinero was meant to provide DIY financial tools for business owners. However, the going got tough when Jessica soon found out that it was “pretty rare” to find people who wanted to deal with the hassles of keeping their own books and file their own personal tax returns. After all, people tend to take the path of least resistance. It took Jessica two years to understand that, things needed to change. After that, she worked hard to completely re-calibrate her business model and turn her product into one that would provide more comprehensive services for her business clients. That goes to show you that if you take the time to find what resonates with your target customers, and your product is good, a higher price tag is not going to deter them from buying from you. So, it definitely pays to halt your business operations and redefine your product when your current model doesn’t work. After you have been running your business for a few years, you may end up getting stuck in a rut. That’s something that you should be wary of as an entrepreneur. Her holiday allows employees to prove themselves and thrive without her interference. The downtime has enabled her to get creative and come up with plenty of ideas on growing her business. Having time off to herself has provided Jessica with the space she needs to come up with longer-term business plans to implement in the future. There is so much that business owners can learn from Jessica since she has experienced both the ups and downs of launching and growing her startup. It does take work to be successful beyond the first five years of business. Take a listen to our full interview with Jessica Mah for even more advice on how to beat the odds of business failure.